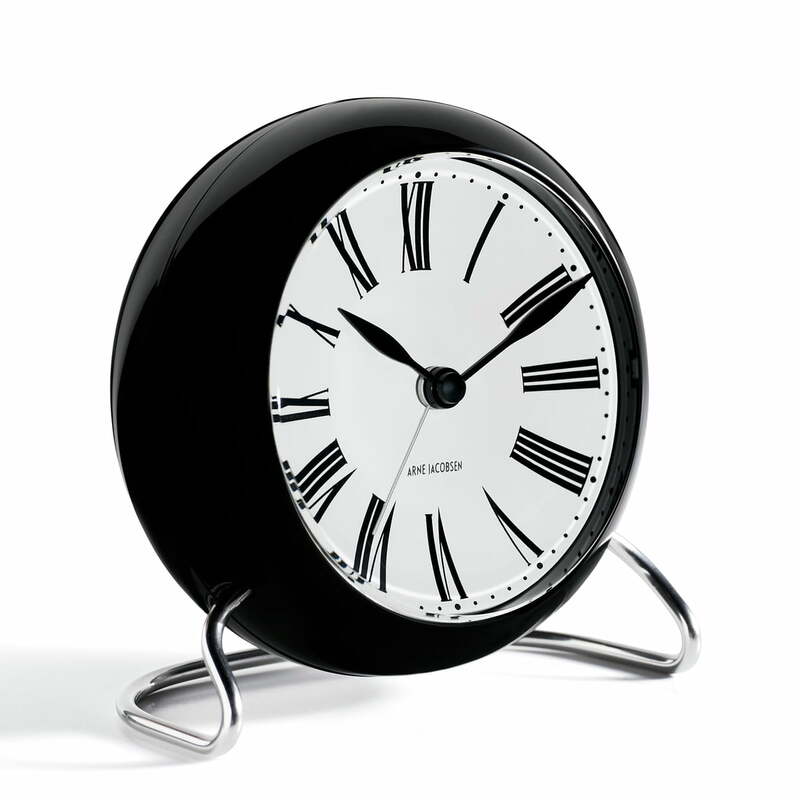 The architectural AJ Roman table clock with alarm, which Rosendahl is relaunching with the Arne Jacobsen Clocks collection, was created in 1939 by Arne Jacobsen, who was responsible for building the house for the managing director of the electrical goods manufacturer Lauritz Knudsen. A hallmark of Arne Jacobsen's design is that it is both architectural and minimalist. At the same time, it was shaped by Lauritz Knudsen's industrial approach to design: with plastic as the new magical material of the time. After being forgotten for many years, the AJ Roman table clock with alarm is now celebrating a strong comeback with the launch of Rosendahl's Arne Jacobsen collection. Thanks to updated functions such as Snooze and light sensor, it is both a clock and an efficient alarm clock, although most will probably consider the Roman table clock a design object. With its graphic black/white colour scheme and elegant metal base with an unmistakable inspiration from the Ameise and Siebener chairs, the Rosendahl table clock fits anywhere in the modern home: in the bedroom, living room, kitchen, shelf and office. The AJ Roman table clock is the ultimate design gadget for lovers. 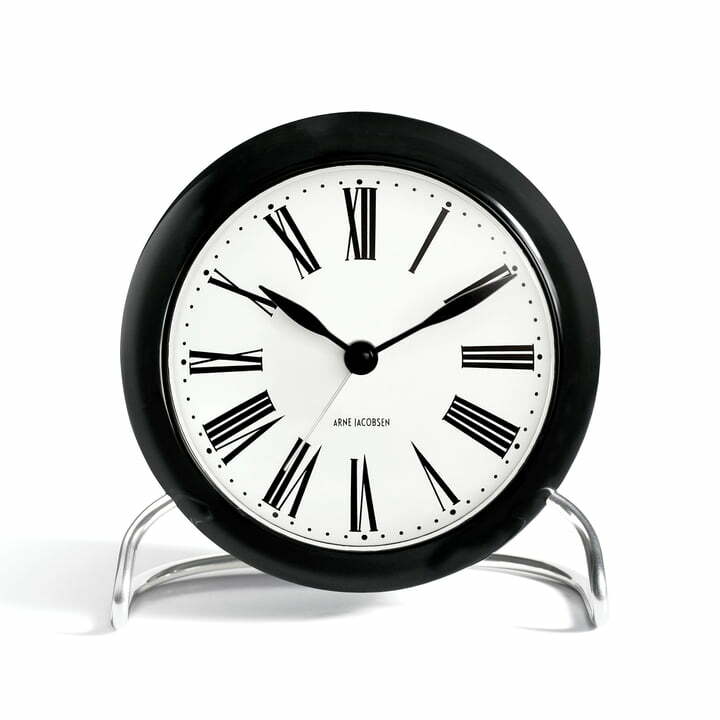 The new edition of the AJ Table Clock is made of plastic and scratch-resistant plastic glass. A motion sensor activates the light on the dial with a single hand movement. The Snooze function of the AJ Roman table clock repeats itself up to five times in an interval of ten minutes. The Rosendahl clock is battery operated and requires two AA batteries. Like Arne Jacobsen's wall and wristwatches, the AJ Roman table clock with alarm is a new design by Rosendahl with respect for Arne Jacobsen's original designs and without compromising on its high quality and overall concept.